Community economic development (CED) is said to consist of three main principles: Self-help; Empowerment and Capacity Building. This page will provide an overview of Community Development (CD), CED (which is a subset of CD) and definitions of these three terms. It also provides a presentation on Community Based Development that led to the establishment of the Kankakee Community Development Corporation, the award-winning Community Economic Development Resource Center and CAN DO! "Community development is the process by which the efforts of the people themselves are united with those of governmental authorities to improve the economic, social and cultural conditions of communities, to integrate these communities into the life of the nation, and to enable them to contribute fully to national progress. This complex of processes is, therefore, made up of two essential elements: the participation by the people themselves in efforts to improve their level of living, with as much reliance as possible on their own initiative; and the provision of technical and other services in ways which encourage initiative, self-help and mutual help and make these more effective." United Nations' definition of community development. The idea of self-help is one of several distinguishing features of community development theory, practice, and ideology. Self-help is based on the premise that people can, will, and should collaborate to solve community problems. In addition to the practical problem-solving utility of this perspective, self-help builds a stronger sense of community and a foundation for future collaboration. It embodies the notion that a community can achieve greater self-determination within constraints imposed by the larger political economy in which it is embedded. Without a commitment to self-help, a community may exist as a place, an organization, or an interest group but be lacking the capacity building strategy. It is a style of planning, decision making, and problem solving which is endemic to the very idea of community, especially that of the small, face-to-face community. Self-help is emphasized not only as a goal to be achieved in and of itself, but also as a strategy for the accomplishment of broader development objectives. Helping communities achieve a capacity for self-help is fundamental to both the theory and practice of community development. If a spirit of self-help doesn’t exist within a community as an extension of the members' dedication to common goals and mutual respect; then, from the perspective of community development or empowerment, a capacity for self-help may be instigated with the assistance of an outside community development practitioner.
" It is this idea of intervention to produce a greater capacity for self-help among residents of a place that is a cornerstone of the community development profession. In community development practice, it is rudimentary that the solution to community problems is sought first within the community, and its resources and capabilities. While the community development approach does not assume that all important social, economic, or political problems of communities can be resolved by a community's own efforts, the idea of mobilizing broad community participation is prescribed as a goal of any community development effort and most definitions of community development include self-help. Self-help embodies two interrelated features: (1)it is expected to produce improvements of people's living conditions, facilities, and/or services)" and (2) it emphasizes that the process by which these improvements are achieved is essential to development of the community. The "developed community" is both improved and empowered as a result. Of these two features, the self-help perspective emphasizes that the process is more important in the long run than the improvements, because the collaboration that derives from a strong sense of community can be the means to continuing improvement of community services and quality of life. By contrast; if community services, facilities, or improvements are contributed by an outside agency or organization with little or no community involvement, such "improvements" are likely to be transitory, to increase community dependency, to contribute little to a greater sense of community, and to diminish the community's future capacity to act on its own behalf. Thus a self-help approach not only emphasizes what a community achieves, but more importantly, how it achieves it. Another way of stating this is to distinguish between development in the community (the improvements) and development of the community (how these improvements are achieved). “Empowerment is another concept often discussed but not always practiced. In broad terms, empowerment is enhancing the possibilities for people to influence those persons and organizations that affect their lives. Empowerment involves recognizing and nurturing the unique strengths and competencies of people that derive from the wisdom of their everyday experiences. Empowerment also entails strengthening social networks and community institutions by promoting a diversity for approaches to deal with social life. An important route to empowerment is building local capacity. When a community and its people are empowered, they have the capacity to articulate their needs; to identify actions to solve these needs; and, to mobilize and organize resources in pursuit of community defined goals. When the people of a community come together to visualize a common future and then work together to achieve it, there develops a recognition that everyone -­regardless of education, job, race, background or whatever -- has something important to contribute to that process. Indeed, the greater the diversity of the participants, the richer the vision and the more effective its accomplishments. Excerpts from a speech given by Lorraine Garkovich before the Twentieth Annual Conference of the Community Development Society, July 1989. According to the National Task Force Report on Community Based Development, what distinguishes community based development from other efforts to revive depressed areas is the emphasis on self-help. Self-help is the presumption guiding successful local revitalization efforts throughout America with projects ranging from simple initiatives such as neighbors volunteering to help weatherize homes to complex models such as real estate syndications and commercial developments. Regardless of the type of endeavor, community based development translates into local ownership of strategies, projects, and achievements. It is this ownership that makes self-help a powerful approach for it produces not only calculable results but also the intangibles that are fundamental to an area's improvement: local expertise; pride; and forward momentum. While there have been many significant positive developments throughout the Kankakee county community since the Fantus Study was conducted, there are still many opportunities for the area to cooperate more effectively and build upon these recent successes. In response to these opportunities, a number of community based development projects have been developed to facilitate the establishment of new more effective partnerships between the public and private sectors, non-profit organizations, and private citizens in order to facilitate the future evolution of the greater Kankakee area. To help explain these programs and their relationship to existing programs in the community, the enclosed chart was developed to present an overview of the existing and proposed community and economic development organizations and activities. 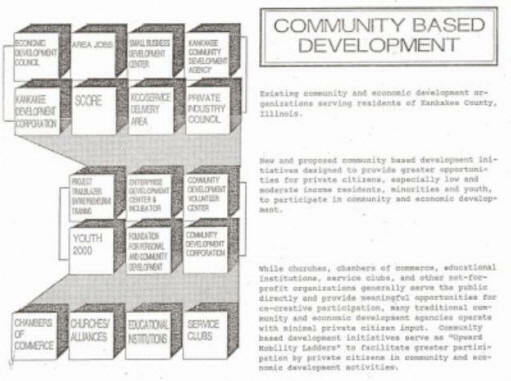 The enclosures present more detailed information on each specific community based development program and a chart depicting how they are interrelated and how they are serving as "upward mobility ladders" to facilitate greater participation by low income individuals, minorities, and youth in community and economic development activities. * For the first time representatives of the four ministerial organizations met to explore the possibility of greater communication among the religious community. * The religious organizations are cooperating on a community unity event which will include presentations by all the participating churches and community organizations involved in personal and community development. * For the first time in the history of the community which has a minority population of 35%, minority and non-minority residents are beginning to share a common vision of community and the means of learning how to facilitate communication and cooperation. * The Kankakee Community Development Corporation, a new not-for­ profit organization, was established to provide expanded opportunities for low and moderate income residents to participate in residential and commercial revitalization and small business development. The CDC will also develop an affordable housing project using a block owned by the City which has already committed over $100,000. to fund this project. Community Development Volunteer and Resource Center, and YOUTH 2000, a county-wide youth leadership development program which has brought together over 50 community and human service agencies to provide educational and recreational opportunities for youth. * The Foundation for Personal and Community Development is offering regular programs with speakers and presentations which foster the further development of communication and cooperation between religious organizations, community organizations; the business community and financial institutions f and rank and file citizens who are responding to the invitation to play a co-creative role in community and economic development and the future of the community. The biggest obstacles we have had to overcome in this community were negative thinking, lack of cooperation, and failure to consider rank and file citizens (particularly youth, seniors, minorities and low income residents) as community assets. To address this lack of vision, the CDA and Foundation for Personal and Community Development and Empowerment have brought in a number of programs and speakers who have presented success stories from around the country. These have included the Corporation for Enterprise Development, the Institute for Community Economics, Jeff Bercuvitz of the Regeneration Project, Gwen Jordan, Director of Community Development for the Community Renewal Society, Dr. Richard Poston, author of eight major books on community economic development and founder of the Graduate School of Community Development at Southern Illinois University, Dr. George Pintar, Executive Director of the Illinois Community Education Association, Dr. Steven Balkin, Professor of Economic Development at Roosevelt University and author of Self-Employment for Low-Income People, and Charles Whitnel; President of the Resource Group of America. In an attempt to address some of the negative findings in the Fantus Study, the CDA held several community brain-storming sessions to identify problems and potential solutions. The questions asked and top three answers to each one are provided below. The community volunteer resource center and the Foundation's programs are designed to address these findings and recommendations and build upon the recent positive developments. (1) What are the greatest problems which affect the quality of life in Kankakee? (2) What corrective measures can be taken to address the problems? Provide resources which will enhance the self-help capacity of individuals, organizations, and the community.